Ethan O'Reilly is a bassist from the New York area. He began playing at the age of eleven, learning both electric bass and double bass. He participated in the New Jersey Performing Arts Center's Jazz for Teens program while in high school, studying with musicians Mike LeDonne and Don Braden. In 2006 he was accepted as the bassist in the New Jersey Governor's School of the Arts program. He continued his music education in 2007 at William Paterson University, where he was awarded scholarship to their jazz program. While attending school, he was chosen to tour China with other music students and faculty from William Paterson University, performing and teaching in Nanjing and Hangzhou. In 2011 Ethan began the Masters program at the Manhattan School of Music, studying under Jay Anderson and Jeremy McCoy. 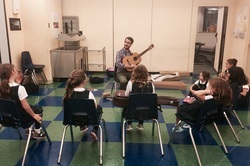 Ethan has been a music educator since 2007, teaching everything from one-on-one lessons to larger workshops. Some notable musicians with whom Ethan has performed include Mulgrew Miller, Jimmy Heath, Freddy Cole, Rich Perry, and Steve Wilson among others.